As I mentioned in the preview report there are certain parts of the Indian story that are not worth telling, atleast until the better parts get their time. So we begin our Indian adventure not in Delhi, Shimla or Kalka but rather Pathankot in the northern Indian State of Punjab. I had gotten severely sick in Shimla days before and now had to catch up with my friends, Thomas Kabisch and Robin Dunkel who had continued on to Kangra in Himachal Pradesh. I had just spent the night in the luxurious Hotel Green and got some much needed rest given that I was still not quite over whatever illness I had caught up in Shimla. 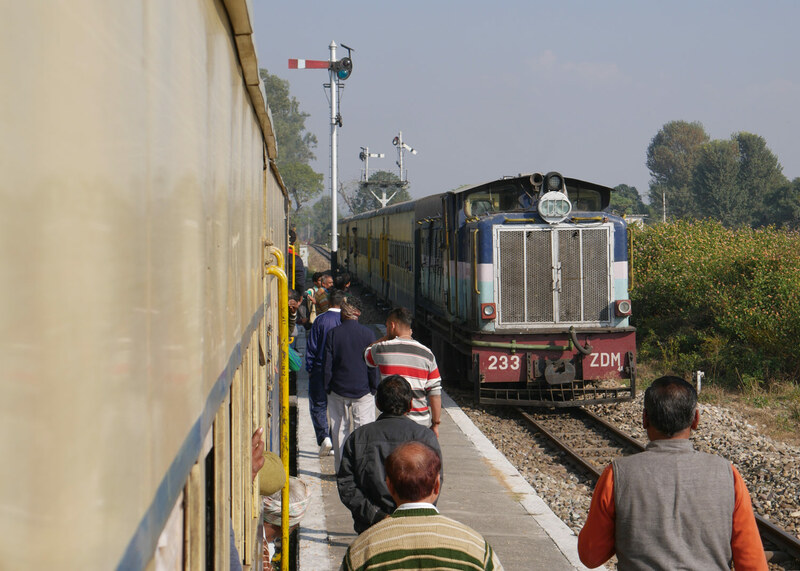 The purpose of this part of the trip was to ride the Kangra Valley Railway, the lesser known of the Indian mountain railways. Unlike the rest the line does not officially having heritage status and does not regularly run any trains catered to tourists like the Kalka-Shimla with most passengers being locals. 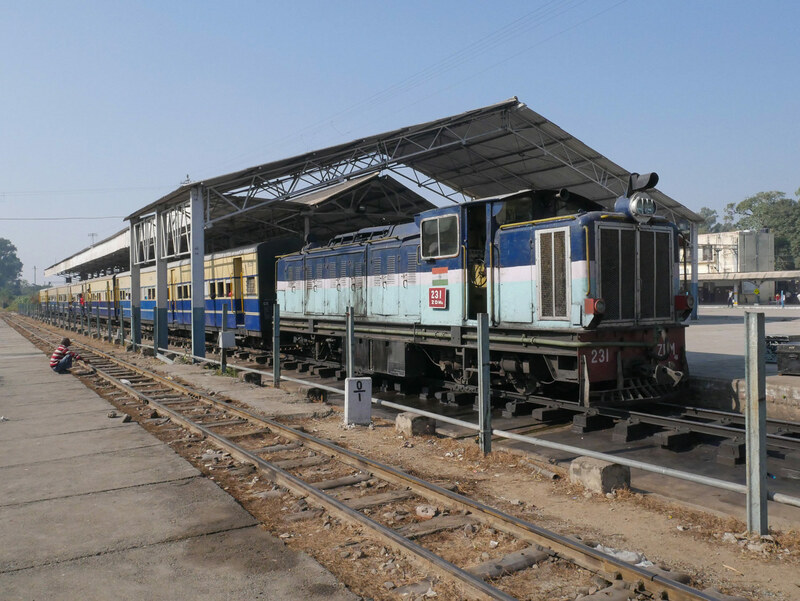 The Kangra was also the last of the hill railways to be constructed, it was built primarily to bring supplies and workers to the site of a new hydroelectric powerstation being built in Joginder Nagar, the eastern terminus of the line. Construction began in 1926 and the line was opened just three years later. Another distinction from the other hill railways was the line was engineered to avoid steep grades, tunnels and sharp curves, anything that would increase construction and operation costs, an added benefit was that the line provides some of the best views of any railway in India and feels like just another part of the the surrounding landscape. 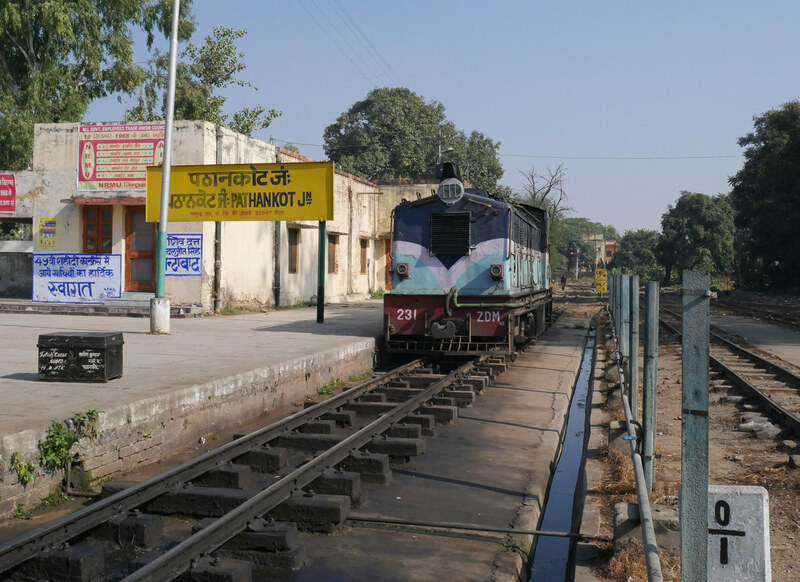 I had been warned by Thomas that the 10:00 service was not running so slept in and casually wandered across the street around 13:00 for the 13:20 departure of train 52467 to Baijnath. I arrived just in time to see ZDM4a 231 backing onto our train which was waiting on the platform and looked to be already full of passengers. Sure enough I found every seat already taken so I took a seat in the doorway, knowing from past experience that if I stood I would soon be wedged into the interior of the coach or have to ride the steps and hang on. 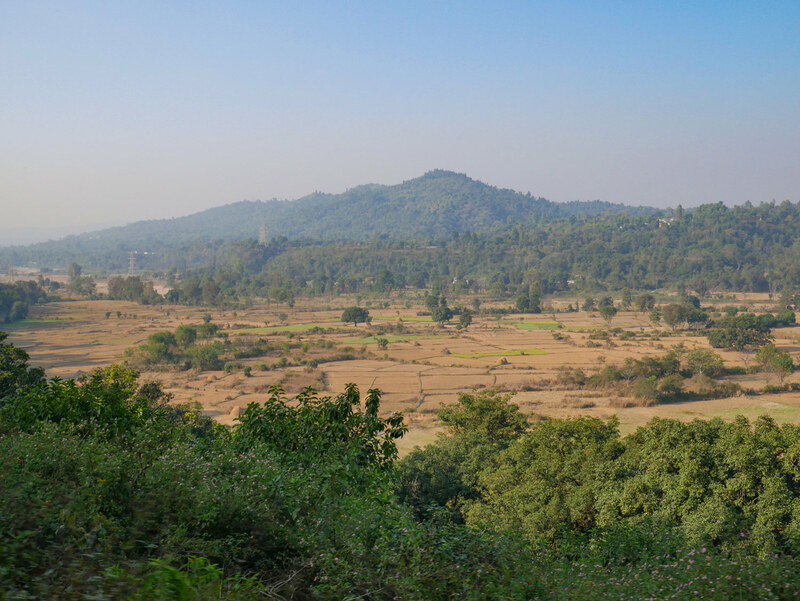 The first few miles of the Kangra are not very scenic, passing through the dusty outskirts of Pathankot and through some relatively flat countryside. At the first station out of Pathankot (Dalhouise Road) we met the westbound service 52466, it would have been a really nice photo but seeing the crowd I dared not give up my seat in the door or it would be immediately be taken so settled for this grab shot instead. Interestingly from my observations, Dalhouise Road was the only station that had a 2 arm bracket semaphore. As I predicted at each subsequent stop we picked up more and more people but I held my ground and kept my step seat so I could atleast enjoy this ride. After departing Dalhouise Road the train crosses Bridge 32 the train crosses from Punjab into Himachal Pradesh and from here the scenery improves. The big alpine peaks of the Himalayans are not yet visible but there are plenty of bridges including some long spans over mostly dry rivers to keep the scenery interesting. Further on we skirted the edge of Pong Resevouir, an artificial lake created in 1975 by damming the Beas River, the filling of the lake required relocating 25 KM of track and the remains of a few bridges can still be spotted. As the sun set we halted at Guler and then kept waiting, the second crossing of the day. 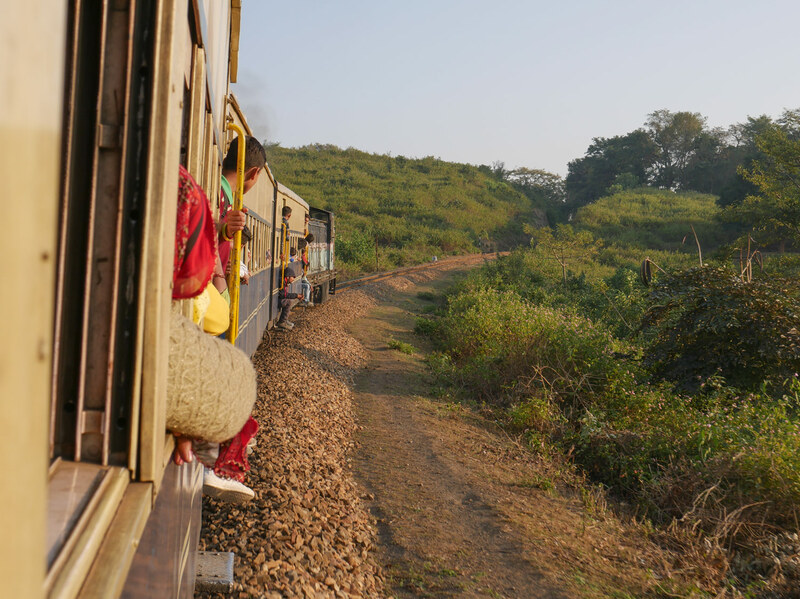 By this point the train had mercifully emptied a little bit so after claiming a seat I wandered around to photograph some of the rustic atmosphere that makes the smaller gauges in India so wonderful. After around 30 minutes of waiting 52468 showed up and it we resumed out journey towards Kangra in the gathering darkness. Finally at 19:25 in near full darkness we rolled into Kangra Mandir station, Kangra is a bit confusing in that there are two stations, one named Kangra which is a small halt far from town and Kangra Mandir which is closer to town but one must still cross an old footbridge to reach the road then hire a rickshaw to reach town. I found my friends at the Grand Kangra hotel and we quickly went to get dinner as all 3 of us were hungry. Thomas showed me his photos from the last days which I was understandably furious about since they were really good. Atleast however we had a few days here in which I could try some of these locations for myself. Unfortunately, it seemed the cloudy weather that had plagued us in Shimla was to return the next day so decided we would try a few spots in the morning then go to the famous hill town of Dharamshala nearby. I’ll admit my opinion is skewed due to being sick but this was by far my favorite hotel in India, it was not cheap but after basically two straight days of travelling while sick it was a much needed break and I felt much better after a long sleep here. Everything worked well without any additional fuss, hot water, comfortable bed and good wifi. The downstairs restaurant was also good serving both western and Indian cuisine (as well as beer). It was more expensive than most other hotels on my trip but still very affordable compared to western hotel rates. Anothe solid hotel and again a bit more pricey than standard for India. It is located far from the tracks but as is nearly everything in Kangra, very convenient to the bus station however. Rooms were clean, receptionist was helpful in arranging a taxi and there was laundry available on site. Hotel had a good resteraunt and bar on site.